When you sign up for shared hosting, your web host decides what facilities will be available to you. It does this by creating hosting plans or packages on the server that is then applied to your domain name. 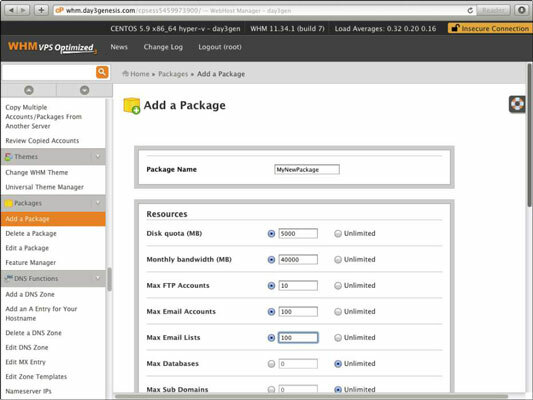 When creating this package, the host defines the facilities and resources that are available to users of that plan. Understanding how plans are defined helps you better understand how shared hosting plans work, and what choices a host is given. Effectively, when you are on a VPS or dedicated server, you are your own host. On one level, the people you lease your server from are your hosts, but on another level, you have control over a bunch of things that previously only your web host could change. You can create a range of different hosting packages for yourself, depending on what you’re going to use your server for. Because the server belongs to you, it would make no difference if you gave yourself unlimited resources in every package, but it makes it easier for you to group them together in your control panel if you have them set up under different packages that have self-explanatory names. When your server was set up, you most likely had to have a primary domain name to set it up under — and this may be the only domain name you use. The primary domain is always set up with a default package that normally gives you unlimited use of all the hosting facilities. If you are using only one domain, you don’t need to worry about setting up other packages or accounts, but most people whose site is big enough to require its own server generally have more than one domain. Although you can set different functions to give you “unlimited” access in your hosting package, you are still limited by what your host allows you to use. For instance, if your host allows you 20GB of disk space then setting the allowed disk space on your server to unlimited grants you an unlimited amount up to the 20GB limit set by your host. Your setting doesn’t override your host’s limits. Before you can set up any domains on your server, you need to set up hosting packages. Your host may well have set up some default packages that may cover everything you require. However, your host may not have set them up, or the plans may not be set the way you would like. The following steps describe setting up a new hosting package using WHM. Other tools should operate similarly. Log in to your WHM using the details that your host provided when you signed up for a VPS or dedicated server. The address for your web host manager is normally whm.yourdomain name.com. WHM is somewhat different from cPanel. cPanel and WHM don’t have many facilities in common. This is because facilities don’t need to be in both and each dashboard has its own specific use and purpose. If you scroll down through the menu on the left, you will see a dazzling array of options, the very names of which may scare you. Scroll down to the Packages section and click Add a Package. Give your package a name. This name can’t be changed at a later date, but don’t worry about getting it perfect the first time; you can create as many packages as you want and delete any you no longer need. Type the name in the box at the top of the page. Scroll through the list and pick which facilities are and aren’t available in this package and how many of each are available. In general, if this is your own server and you aren’t sharing it with other people, you can select Unlimited for all of these options. The advantage with giving yourself limits is that you will be notified by e-mail when you’re reaching those limits and will thus find it easier to manage how much bandwidth and disk space you’re using. The options are fairly self-explanatory. The amount of disk space you can select is up to that available under the hosting plan you have purchased. You can also select the amount of bandwidth available and many other options, such as the number of FTP accounts and a number of e-mail accounts that can be created. When you have selected your chosen limits, click Add at the bottom of the page. Your package is saved. You can go back in and edit the limits at any time. That’s all there is to creating a hosting plan. You now have a package that you can use for any domains on your server. Scroll down to Packages in the left-hand menu. Select your package from the list and click Edit.